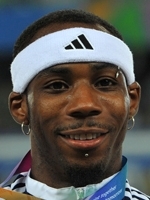 With his many body piercings, dyed red or blue hair and knee-length white socks with matching wrist and headbands, Great Britain's Phillips Idowu is as adept at working a crowd as he is at the hop, skip and jump of the triple jump. The flamboyant Londoner will be desperate to go one better on home turf than four years ago at Beijing where Portugal's Nelson Evora edged him into Olympic silver. Idowu jumped his season's best for 2008 of 17.62m at Beijing, but still lost out to Evora's last-gasp 17.67m leap. The Briton, who is of Nigerian origin and whose sister Oluyinka represented Britain in the long jump at the 1992 Games in Barcelona, was doubly frustrated having jumped three of the world's top ten triple jumps in 2008 and having won the world indoor title at Valencia earlier in the year. At 33-years-old, London 2012 would also appear to be the last chance saloon for Idowu in terms of claiming an Olympic gold. However since 2008, Idowu has been hard at work, with titles and medals to show for it. His first significent triumph was at the 2007 European indoor championships in Birmingham, England where he leaped 17.56m to take gold ahead of compatriot Nathan Douglas while Russia's Aleksandr Sergeyev picked up bronze. Then when the 2009 world championships took place at Berlin and as is often the case with narrowly defeated Olympic finalists the stage was set for a show of force from the beaten man and with his face littered with piercings, Idowu kept with tradition. He claimed the gold medal with great panache and a mark of 17.73 metres - the best in the world that season - while Portugal's Evora was second with 17.55m and Alexis Copello of Cuba was third with 17.36m. His efforts and the fact that particular performance at Berlin came while he was nursing a broken arm won him the gong for the 2009 European athlete of the year. Idowu is not one to let down his guard. He again had a world best performance for 2010 which came at Barcelona in July as he claimed his first European crown with a personal best of 17.81m to claim gold ahead of Romania's Marian Oprea, who took silver with Teddy Tamgho of France winning bronze. The 21-year-old American Christian Taylor of the United States came out of the woodwork at Daegu in South Korea to win the 2011 world championship gold medal leaping 17.96 metres to send a shudder through the sport. Taylor was just shy of the 18-metre barrier, over which only three men have jumped, thereby setting a major challenge to all-comers a year ahead of the Games. Idowu took silver (17.77m), with another American, Will Claye, claiming bronze. Evora has a fractured femur that will keep him out of the London Games but Idowu now has another rival to watch out for in the form of Taylor. Whichever medal the Londoner claims, his charisma and colorful outfits will mark him out as one of the stars of the show in the English capital.